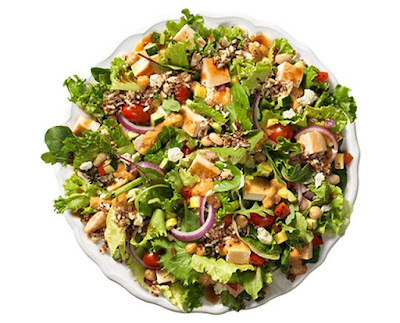 Wendy's debuts the new Power Mediterranean Chicken Salad with ingredients like quinoa, chick peas, and white beans for a different flavor profile from their current line-up. The salad features a blend of quinoa, chick peas, white beans, fire-roasted vegetables (red and yellow bell peppers), and sundried tomatoes plus lettuce, spring mix, red onions, grape tomatoes, grilled chicken, crumbled feta, hummus, and a light balsamic vinaigrette. Each full-sized entree Power Mediterranean Chicken Salad contains 40 gramsof protein but actually falls somewhere in the middle of the pack protein-wise as far as Wendy's current salad line up goes, although it's the lowest calorie-wise and contains the most fiber. The salad was tested in several cities late last year. The suggested price for a full-size salad is $6.49, while a half-size salad goes for $4.49.